Baby Shower Invitation. 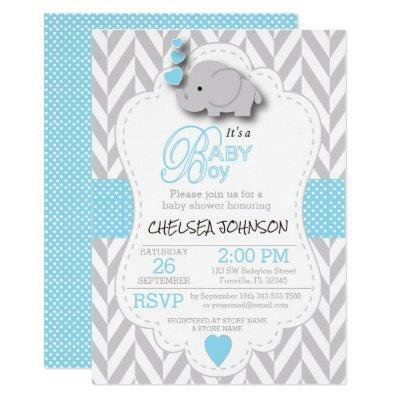 Featuring a gray chevron pattern with baby blue and white polka dots and a cute adorable cartoon baby boy elephant. Impress your guest with this darling invitation. % Customize-able. Ready to fill in the box(es) or Click on the CUSTOMIZE IT button to change, move, delete, resize any of the graphics or add your own text, font and font color. Made with high resolution vector graphics for a professional print. NOTE: (All zazzle product designs are "prints" unless otherwise stated) If you have any questions about this product please contact me at or visit my store link: ( Copy and Paste ) I&#;ll be happy to help. Thank you for the support and stopping by my store -DesignsbyDonnaSiggy.